Cook lasagna noodles according to directions. Drain and set aside. In a food processor, combine all of the tofu ricotta ingredients. Blend until smooth. Heat olive oil in a large pan over medium heat. Add onion, peppers and mushrooms and cook for 3-5 minutes or until softened. Remove the vegetables from the pan and set aside. Place the chopped sausage into the hot pan. Cook, stirring regularly for 5 minutes or until browned. Return the vegetables to the pan and add 4 cups of tomato sauce. Bring to a simmer. In a large, deep pan place 1/2-3/4 cup tomato sauce and one layer of lasagna noodles. Then pour half of the sausage marinara overtop. Add another layer of noodles. Then spread the tofu ricotta over the noodles. Add yet another layer of lasagna and then the remaining sausage marinara. 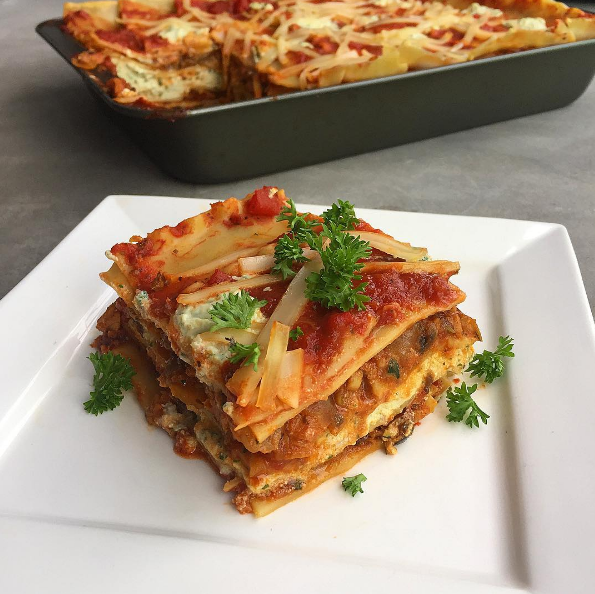 Top with a final layer of lasagna noodles, pour the remaining tomato sauce on top and sprinkle with vegan cheese (optional). Cover with foil. Bake Lasagna, covered for 30 minutes. Remove the foil and cook for an additional 10-15 minutes.